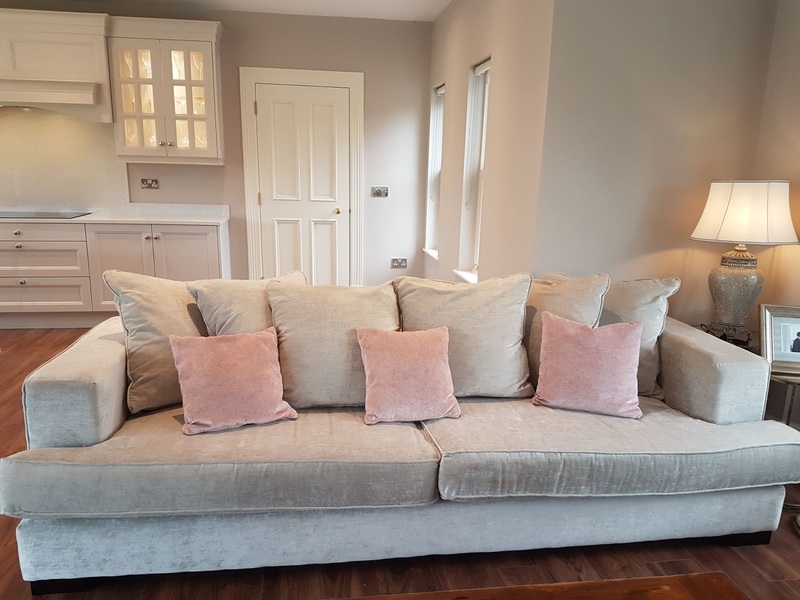 When decorating our living room in our new house we wanted to choose a couch that was comfortable but that also looked good! So we picked this four seater "Americano" suite from Kingsbury Furniture in Tallaght - check them out at https://www.kingsburyfurniture.ie. I wanted to keep the cream & grey tones so I went with this light grey velvet fabric for the suite! I know, I know, it is such a light colour & def. not for everyone but I absolutely love it! I have it over a year now & I have a 10 month old baby & there isn't a mark on it! Of course you can get it sprayed to protect it & the staff at Kingsbury will be on hand to advise you on your options. 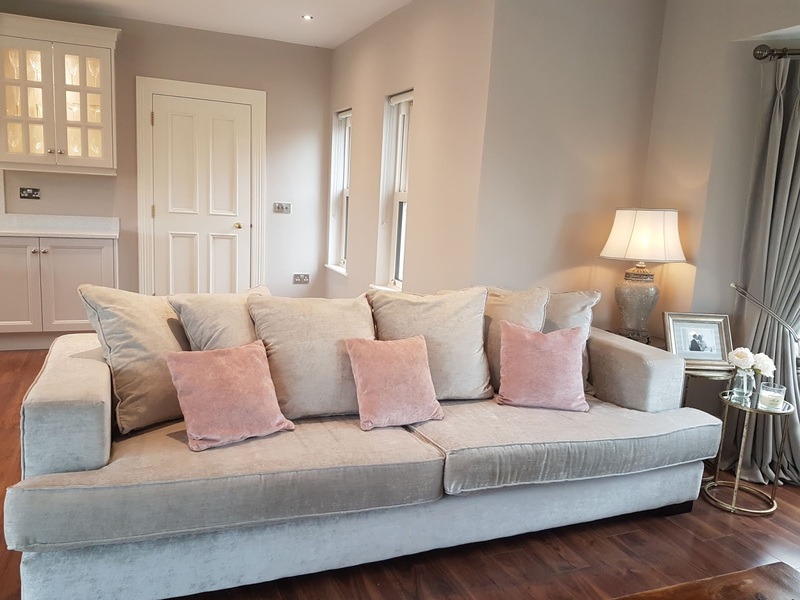 The colour fabric that we picked is called "Slub Stone" but this suite comes in a variety of different shades so there are lots of options to choose from. 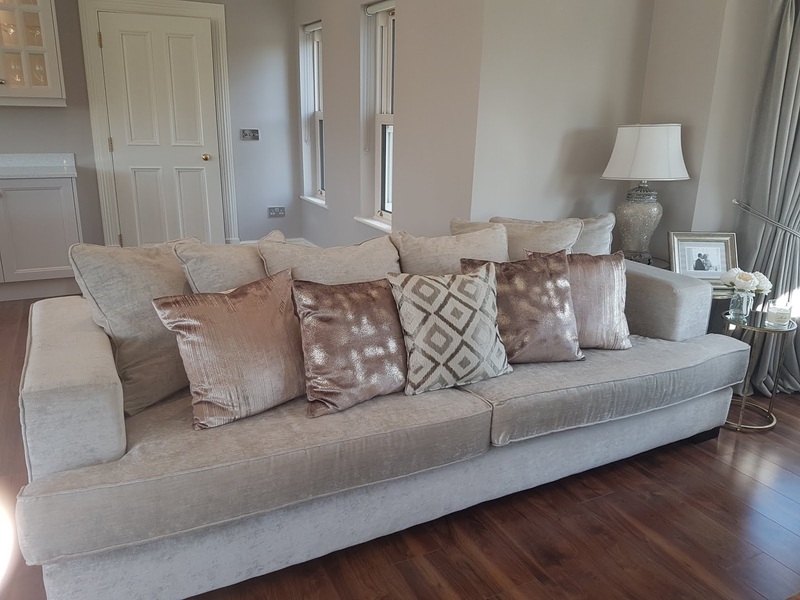 The couch comes with three small scatter cushions & again you can select from many colours depending on your rooms colour scheme. 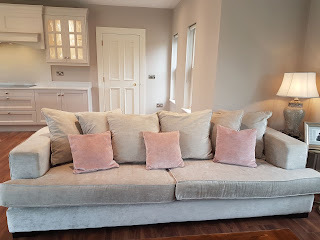 I absolutely love blush pink so we picked .....well I picked 😅 ...the blush pink scatter cushions! 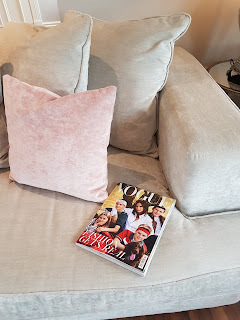 They are fab little cushions but just living with the couch & in the space I have it in, I decided that I needed cushions with print & something that could add some texture to the flat colour of the suite. I picked up the five scatter cushions with a mix of strips & geometric prints from Next Home. I adore the sort of champagne gold & rose colours mixed with the grey. 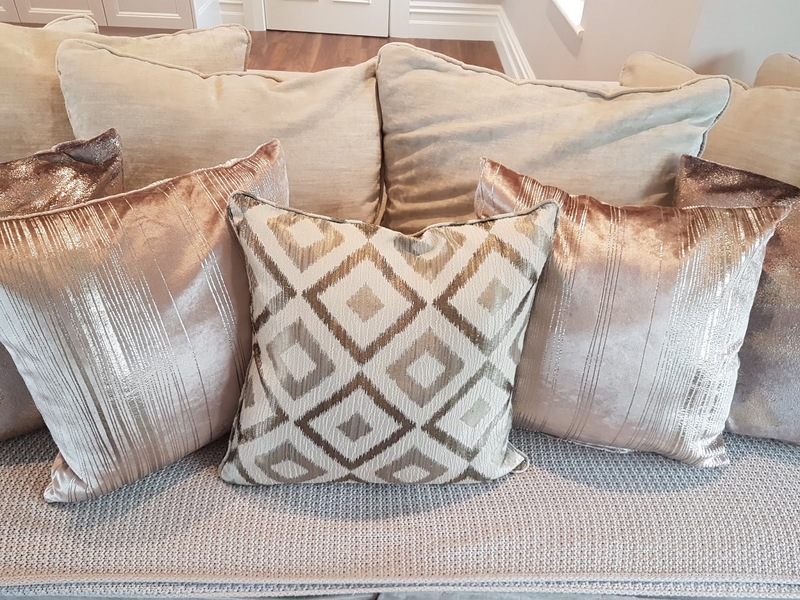 I also keep a throw on the base cushions at all times just to protect the fabric. This one is almost the exact same light grey colour so it blends perfectly! I picked this one up in Marks & Spencers last Christmas! I promise I will do a room tour soon - I am just finalising the rest of my furniture in the kitchen/living area first so I will give you all a sneak peek soon I promise. Just to add - the "Americano" suite can be purchased in many different sizes & is Irish made so the turnaround on getting it was quick! 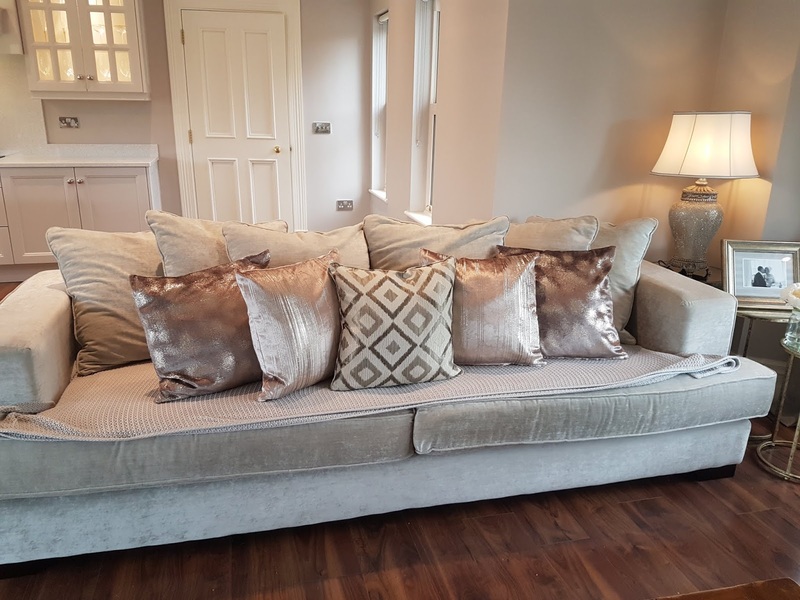 You can contact Kingsbury Furniture or pop into store to find out more. 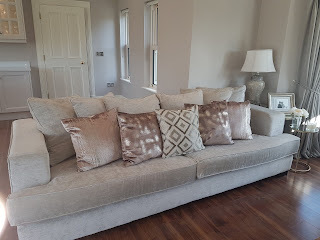 Also Kingsbury have kindly given me a discount code to offer to all of you so if you use code Paul 1851 you can avail of 10% discount of all ranges excluding special promotion offers, floor model discounted offers or flooring! 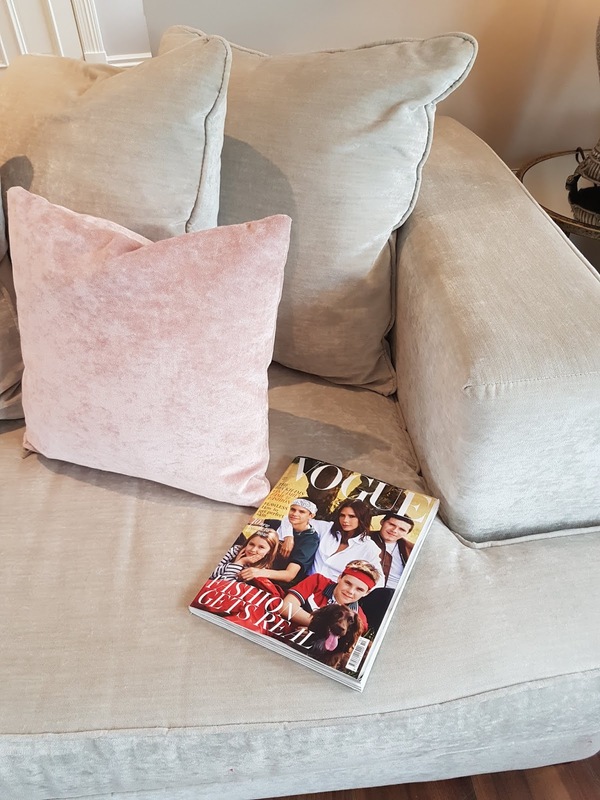 So it is def worth popping into store for a browse - they have a beautiful show room in Tallaght & they stock so much more than just couches - so worth a visit if you are in the home styling market! 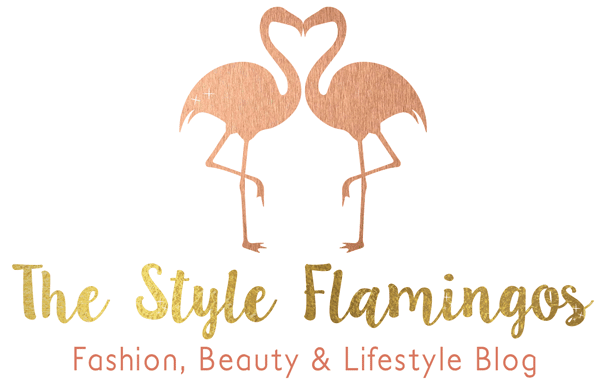 If you do purchase anything tag me using #thestyleflamingos in your photographs on Instagram so that I can see your furniture picks. My home renovation campaign is going to be incomplete without buying the best interior design accessories that suits the current trends. Thanks for this blog which showed variety of steps to make our living room beautiful with the furniture. this is interesting post. It showed variety of steps to make our living room beautiful with the furniture. please check out here: "http://www.timberavenue.com/product-category/wholesale-home-furniture-shops-in-chennai/"
The concept is perfect for my house design plan by http://topnotchconstructionph.com/. Nice information. Thanks for sharing content and such nice information for me. I hope you will share some more content. Please keep sharing! While plan and cost are substantial contemplations, there are different variables that should be considered yet are completely disregarded by many. Two vital contemplations that are overlooked are the wellbeing and natural advantages of the furnishings have. These two are substantial criteria that one ought to think about while getting furniture other than considering only the cost and structure.